I've always admired Trikont's releases if for no other reason than that you know that you're never really on safe ground with them. Whether it's Finnish Tango, American Yodelling or one of my favourite releases of last year - Dead and Gone No 1 - Funeral Marches (Trikont 0234), there will always be something that either staggers, baffles or downright irritates you. But, in fairness, you're never bored! 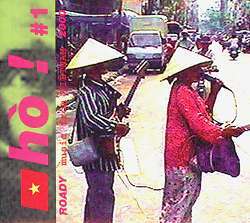 I assume this CD is intended to act as a soundscape of today's bar and street music scene in Saigon. I say assume because while the English section of the notes (the bulk are in German) do give a brief and confusing account of the city's gay scene, and a useful recipe for chicken pho and noodles, they do not really help a great deal in putting this music into any context. There is, I'm afraid, a fair amount of pretty uninspiring MOR here also - a rather cheesy blend of traditional instruments and schmaltzy vocals, Eastern film music and Western popular (well popular 20 years ago) that I can't see appealing to too many readers of this review. Even less the younger and more heavily Western influenced and truly turgid SRV Opera Singers and Dylan Thanh. So - something for everyone then? Well maybe not, but for those in search of the exotic, the unusual or just plain weird, certainly enough to warrant giving it a try. But be prepared for a few pretty uncomfortable moments. Available from Klang Distribution, Clonan House, Midgehole Road, Hebden Bridge, HX7 7AA, UK.